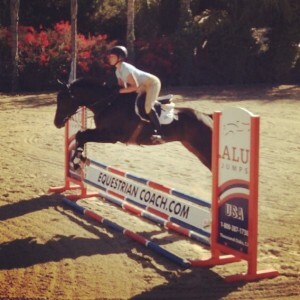 We are excited to present the first EquestrianCoach.com Riding Workshop Scholarship recipient. Each year Bernie Traurig will select someone who participates in one of his clinics throughout the country to receive the scholarship. To qualify, the person must show financial need, passion, drive, talent and a desire to continue on in the equestrian sport. 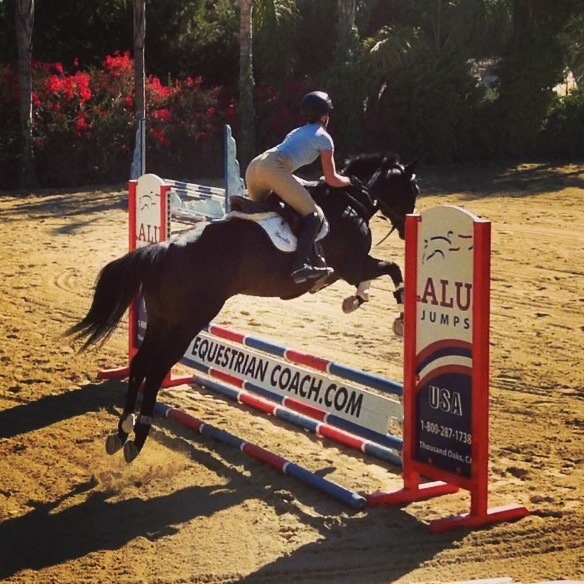 Annah’s plans to continue on with her training with the goal of showing in the medals as a junior and one day ride in the Olympics. – Amy Shanahan, Annah’s trainer at Hawley Farm Stables in Blountville TN. Equestrian Coach Riding Workshops are held at Bernie’s facility in San Marcos, California. Participants ride twice daily; with flatwork in the morning sessions and course work in the afternoons, followed up with dinner, Q&A and video analysis. Scholarship applicants must participate in a current clinic between October and June of each year to be eligible for this annual scholarship. 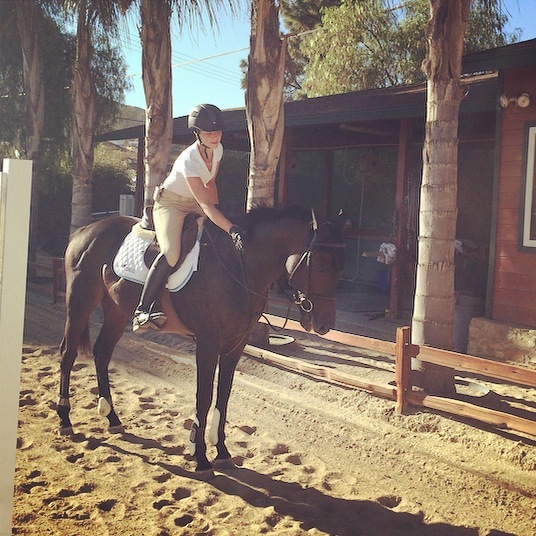 “Today I had a great lesson with Bernie. I’m enjoying getting to know him and the horse I am riding. 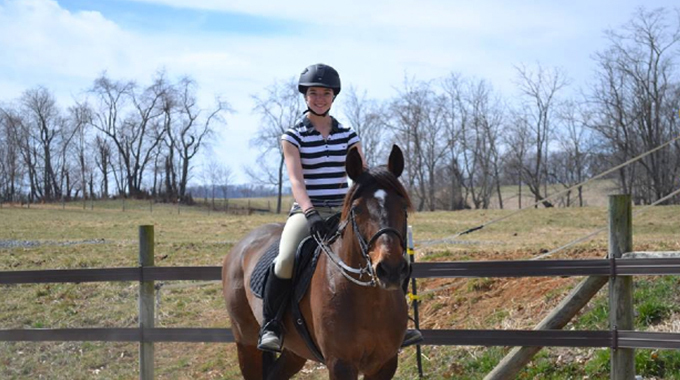 Magic is a green 6-year old bay gelding, who I think has a lot of potential. Bernie is training me how to train and ride him. Riding Magic is exciting and he has already taught me a lot. He is slow to react to my leg and does not know how to back, which also effects his breaks. Therefore I am learning how to halt with a braced leg and how to get him up and moving. If I had the choice to pick another horse I probably wouldn’t because he is just so much fun to work with and be around. “Today was a very challenging but successful day. Bernie chose to begin our first session with gymnastics and technical lines. This allowed me to work on my position and develop my eye within a line. It also challenged us with the task of adjusting our stride length. With this skill we were able to complete different numbers of strides between fences. This also allowed Bernie to critique ours hands. I quickly learned that keeping your hands 10 inches apart helped my green horse stay straighter and consistent within the line. Another technique that came in handy was how to steady a horse properly. I had no idea that I could just close my hand and he would come back to me. This hand action came easy to me because it required the same hand action as milking my dairy cow. Although this hand action came easy to me, I struggled with my eyes and checking my leads. At one point Magic and I almost left the arena. Bernie at this point saw this as a moneymaking opportunity and decided to charge me 25 cents for every time I looked down. Needless to say, Bernie is a dollar fifty richer. The good news for me was that by the end of the day I was able to feel my leads! Even though I learned a lot today, Magic seemed to steal the show. In the first session he was more willing to move forward. He was still a little heavy on the bit in the downward transitions. Bernie saw this as a opportunity to try a new bit. We changed his bit from a full cheek French link snaffle to a simple loose ring snaffle. He loved it! I saw a significant change in his willingness to not only halt but also to back up. I was very proud considering he wouldn’t even take one step backwards yesterday. I also noticed a difference in his promptness to the leg and we were able to conquer the walk to canter transition both ways. “Today started out with some excitement because I was able to witness Bernie in action! He decided that he wanted to ride Magic before me in order to see if he could get flying lead changes. Of course Magic conquered the changes both directions with Bernie’s assistance. Bernie and I agreed that Magic must improve his transitions, counter cantering, and be more accepting of the bit before we really go into flying changes. Still, it was nice to see that in the future he will be able to master the flying change. Once I mounted Magic we began a review day. We worked on promptness to the leg, acceptance of the bit, backing up, and of course straightness. I worked on my hands and keeping them 10 inches apart and not looking down at my leads. It was a little on the expensive side when it came to my eyes. I ended up owing Bernie Traurig two dollars and fifty cents at the end of the day. “Today I arrived at the barn a little excited and a little nervous because I was going to have two private lessons with Bernie. This meant constant work and nobody to distract him from my continuing wandering eye. My first session was about my eyes and Magic’s acceptance of the bit. I think Magic woke up on the wrong side of the stall this morning, because he was quite resistant in the beginning of the session. But as the day unfolded, he regained his sense of humor. My eyes, although, were a different story. This first session ended on a very good note with me gaining the ability to feel my leads three strides after the pole. I was able to keep my eyes up and not lose anymore money. But in the second session my old habit came back to bite me in the rear end. At one point I owed Bernie 10 bucks with a threat of owing him 20 bucks as I was in the double or nothing game. Thankfully, I pushed past my old haunting habit and was able to hold on to all of my money. “Sadly, today was the final day of the workshop and my partnership with Magic. 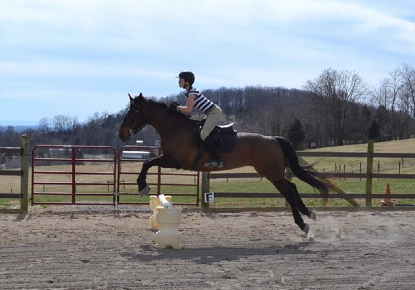 We started out in the first session with just some flatwork. We reviewed the basics of a forward walk, a prompt halt, backing 4 or 5 steps, prompt upward transitions and walk to canter transitions with my eyes up. He gave me a little trouble, but quickly worked out of his crankiness. Bernie decided today was the day to work on the lengthening and shortening of his stride. Surprisingly, he was very willing and mastered the skill with ease. In the second session he excelled in his transitions and he once again flexed at the poll while backing up. My wandering eye did not fail me today, and I was able to feel every lead. Toward the end of the lesson, Magic and I were able to complete a course that consisted of a steady three stride line, a bending five stride line, a couple of verticals and three simple lead changes. It was a very nice round. Week in and week out, Bernie can be found criss-crossing the continent or even traveling to South America, Europe and beyond, keeping up with his very busy clinic schedule. View his clinic calendar to see if he is doing a clinic in your neck of the woods or to find a week or weekend that he has free to schedule a clinic at your barn. Check out his Clinic Page for more information. 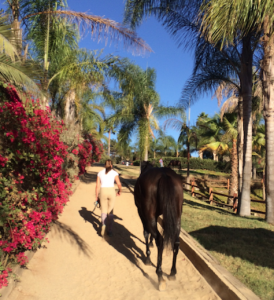 You can also work with Bernie by participating in an EquestrianCoach Riding Workshop, an all inclusive immersion course at Bernie’s own private facility in Southern California held several times throughout the year. The Workshop Page has all the details. 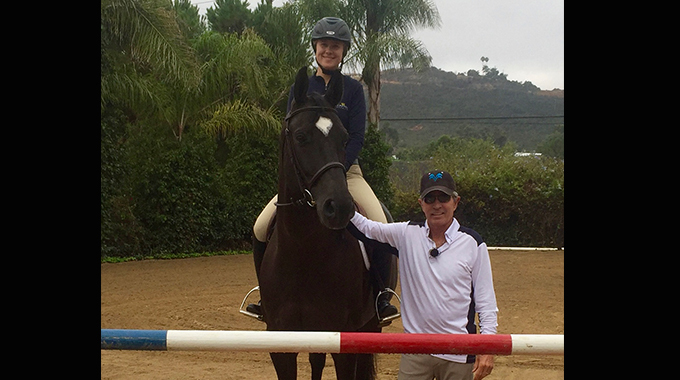 Scholarship recipient, Stephanie Nagler, shares her story and her top ten list of things she learned at Bernie's private workshop. How do you apply for a scholarship? We attended a clinic in November. Thanks! There is not an application process for the scholarship. It is determined by Bernie, who each year will select someone who participates in one of his clinics throughout the country to receive the scholarship. To qualify, the person must show financial need, passion, drive, talent and a desire to continue on in the equestrian sport.